Libby Morgan: Reunion is finally here! First in my American Heritage Quilt Series! 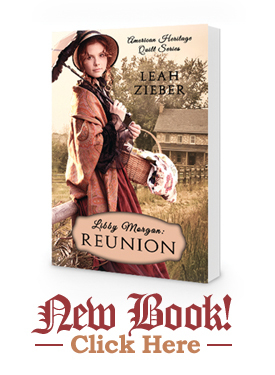 I am so excited to kick off my new weekly blog by announcing the release of my debut novel Libby Morgan: Reunion. I hope you will enjoy getting to know the Morgan’s as much as I enjoyed writing about them. This tender, coming of age story introduces the young Elizabeth (Libby) Jane Morgan and follows her through her thirteenth summer of new adventures at home and abroad. As she discovers her family’s history through old letters and stories, Libby learns the art of quilt making from her very talented Grandmother Morgan. Her keen eye uncovers a mystery that can only be solved with a visit to the Foundling Hospital in London; but the visit may prove more than Mother Morgan’s faith can withstand. Libby’s tenacity pushes her family to be hopeful where there is no hope and helps to secure her father’s inheritance. A perfect read for young girls to enjoy with their mothers and grandmothers; you can pick up your copy of Libby Morgan: Reunion at Amazon, Nook, iBooks, and Smashwords. Kindle will be available on October 5th. My first historical fiction novel has been two years in the making and a long road of new adventures in rejection, revelation, and self-publishing! I am grateful for the many wonderful people I have met along the way, grateful for my family and friends who encouraged me with each new step, and especially grateful for the strength God has given me to push through when faced with adversity. I am still learning about the self-publishing process but have gained a great deal of knowledge which I am happy to share with anyone thinking of undertaking this adventure. I had always kicked around the idea to write a book, but never fancied myself a ‘writer’ in the truest sense of the word’s meaning. Little poems and ditties were forever finding their way into my quilt labels, but writing a whole book was something altogether different. Even now I am amazed that 313 pages of words, sentences, characters and plots were able to come out of my brain and find the page. My advice to anyone considering the task – DO IT! Even if you think no one will ever read it. The process was cathartic and crucial to the healing of some life wounds. I find that many of my characters carry pieces of my own life experiences in their stories and the whole activity of writing it all down helped to strengthen my resolve for a happy future. 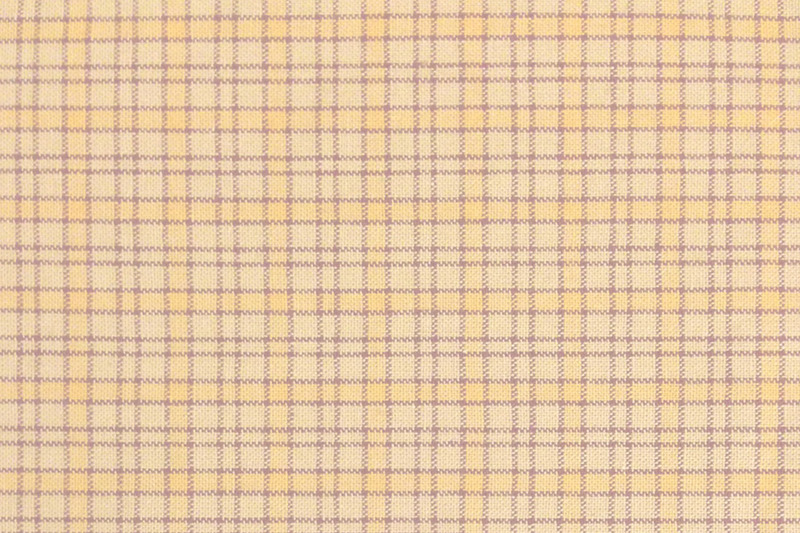 QUILTS? Yes, there are quilts in the story! I am a quilt maker and I love antique quilts. I knew the story needed to include descriptions of antique quilts, but that just wasn’t enough. I decided I wanted to make the quilts I had described in the story. Unfortunately, there wasn’t enough hours in the day, so I enlisted the help of my very talented mother-in-law, Val Jean Zieber to help with some of the projects. She is a wiz with a needle and her workmanship is top notch! Pictured below you can see Libby’s Hexagon Mosaic quilt which Libby learns to make with the help of Mother Morgan. In the story, Libby paper pieces her hexagons in the same method that has been used for over two hundred years. Val Jean did the same. She used some precut templates, but when she ran out, she improvised and made her own from scrap paper. Using fabric from my cave of wonders (aka, my stash), Val Jean pieced the top hexagons. I finished the top by adding the Turkey red borders and my wonderful long-armer, Susan Davis, did the quilting. I think the results are lovely! Here is a close up of Libby’s quilt. I just love the quilting! Tune In Next Week. 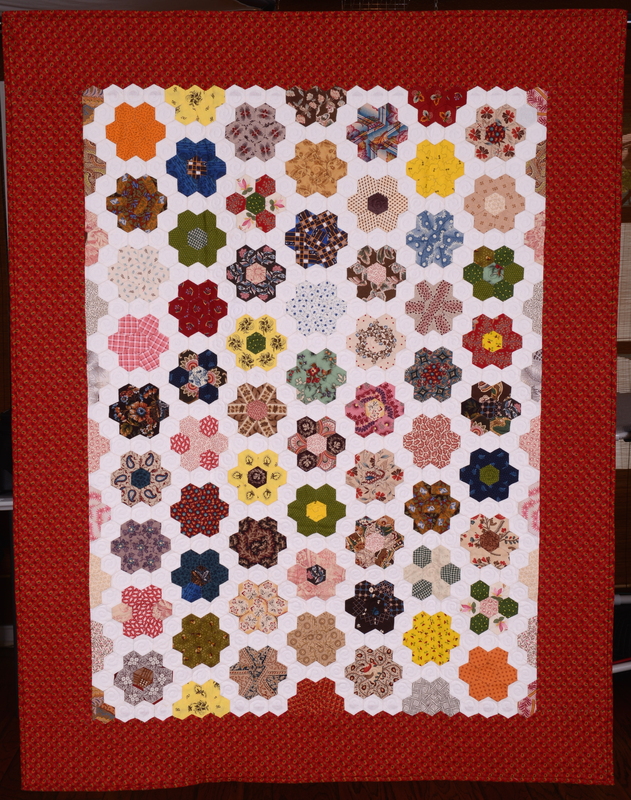 . .
I’m kicking off my weekly blog with today’s introduction of my new novel and Libby’s Hexagon Mosaic Quilt. I hope you will come back next Sunday for the next installment of Libby Morgan: Reunion and the wonderful projects I have to share with you from the story. Next week’s highlights will include some excerpts from the book as well as detailed images of the wedding hankies and seed bags (both antique and reproduction). 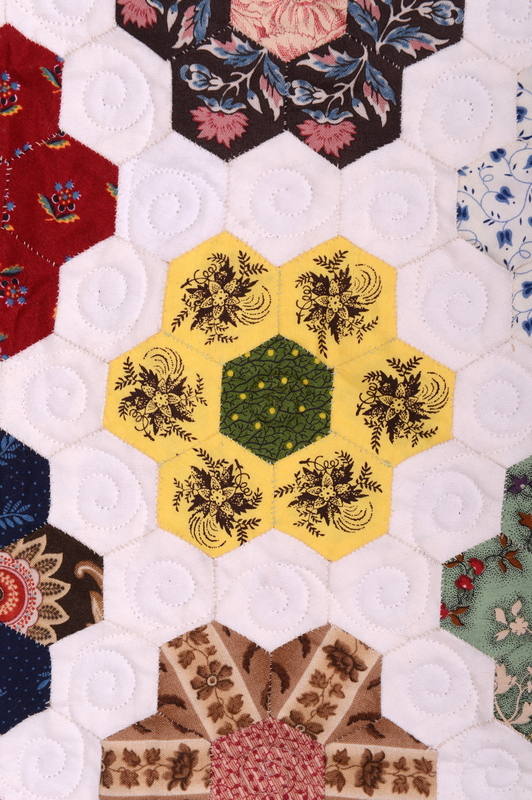 Periodically, I may come upon information I am inclined to share – everything from exploring in detail an antique quilt from my collection to quilting news and events that are important to pass along. So check back often to see what’s new. And if you find a topic that interests you, send me a message and we can explore it together on the blog. Thank you Gai – And I’ll be sending your magazine out this weekend! Congratulations I am so happy for you. God willing and the creek don’t rise, I will be at your book signing. Let me know if there is anything I can do to help you. On FB you mentioned a display of a few antiques. Only sewing related ones I have are irons so if you need/want to use a sad iron, fluter, coal or slug iron just let me know. i am so excited for you Leah, congratulations and best wishes for huge success. Debbie and I will be at your book signing. Can’t wait to see you again.